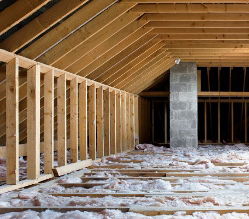 Before you insulate your attic you should kick off by deciding what you are actually going to use it for. For example you might just want to use it for storage and have no intention of changing it into a habitable room. Or you want to extend your living space in your home with an extra bedroom and bathroom. If your loft area is not going to be used for storage or a habitable room then the most economical option would be to insulate the floor of the loft. This can easily be done with Fibreglass Loft roll insulation. Current building regs command a minimum of 270 mm overall thickness to be installed. This can be achieved with a layer of 100 mm between the floor joists and then a layer of 170 mm over the top. These should be laid in the opposite direction so as to eliminate any gaps in the overall sandwich of insulation. This of course depends on the depth of joists. As for example you may have 150 mm deep joists so 2 layers of 150 mm would cover this. You would not want to put a thicker insulation than the depth of the joist to start as this makes it extremely awkward to see the timbers to walk back across to install the second layer. We are suppliers of Knauf Earthwool a non irritant fibreglass. This is easy to install and does not give the horrible rash and skin irritation that previous fibreglass insulation materials have in the past. When installing fibreglass insulation in an enclosed space always wear the appropriate safety equipment. Notably such as goggles, gloves and protective breathing masks. If your loft area is to be used as storage then you can still install fibreglass insulation. Installing a system of loft legs which are plastic raising pieces fixed on the timber joists and then a layer of tongue and groove chipboard flooring fixed across the top. This then effectively raises the level of the floor by the depth of the top layer of insulation and enables you to use it for storage. You can also use a rigid insulation board to insulate the floor of the loft and also in the pitch of the roof. This takes away the need to install the loft legs and also saves head height in the attic space. Multi foil insulation is another type of insulation that can be easily installed with the minimum of skill. This type of insulation is made up of layers of foil , wadding and sheep wool. Installation is easy with the material stretched across the length of the roof under the rafters fixed with builders staples. Each time a new layer or joint is made a minimum of 100 mm should be allowed as an overlap. Must be remembered each joint should be sealed with aluminium foil tape. When Converting your loft area for use as a habitable area you must do this to conform with building regulations. You should be advised on Insulation ‘u’ value targets to achieve. There are many different construction methods to achieve the Target ‘U’ values required when insulating your loft. For example you could insulate with Celotex or Kingspan rigid insulation boards. These fitted in between the rafters of the roof and then covered with a layer of insulation and plasterboard. Alternatively you could install rigid PIR insulation boards between rafters. Followed up with a layer of multi foil across the underside. Important to realize that you must leave appropriate air spaces either side. This is just a few examples of many ways in which you might insulate your loft space when converting it into a living area. For more information about insulating your loft , or for the best prices on insulation materials please do call our friendly sales team on (01793 791010). Alternatively send us an email at info@bmdinsulation.com and we will get back to you as soon as we can.